This is my nephew Billy. His story may sound familiar to parents of children with autism. When Billy was slow to develop language, red flags went up. He didn't make eye contact as much as we would have liked and didn't interact with toys in the "normal" way of a toddler. My sister and her husband went through many years of anguish to get the correct diagnosis and treatment for Billy. All of these things are what many families go through with a special needs child and it is so hard to endure. I honor and respect my sister and her husband for the grace, determination and love they have showed and shared in this process. Children with autism share many traits, but they are also unique in their own way. Let me tell you a few things about Billy that are unique to him! He can be seen riding around Lake George and the city of Wellesley on the back of a tandem bike with a big grin on his face. He loves to walk and often takes a dog with him. We were surprised to learn he had named two of his stuffed animals after our real life lake dogs! His athletic prowess is also noted in his long distance swimming at Lake George. His form is unconventional but he is faster than most of us. In fact, he has won 24 medals in the Special Olympics. He would win more if he didn't stop mid -race to acknowledge the crowd! The words he speaks are few, but he will sit and listen to conversations, surprising us with his understanding. Uncle Mark can always bring a smile to his face, especially when he lets Billy drive his tractor, yikes! If you love to cook, Billy is your guy. He appreciates food, like no one else. As a child and as an adolescent, Billy was not the neatest eater. His parents were constantly challenged with keeping him in a clean shirt and doing piles of laundry. “I wish the bonTop bib had been available to me. It would have really helped out.” – Billy’s Mom. My sister now works as a Special needs trust attorney, helping families just like hers plan for the future needs of the loved one. A perfect fit for her and Billy showed her the way. Billy has two younger brothers who are caring, empathetic and kind. I think Billy had a hand in that too. 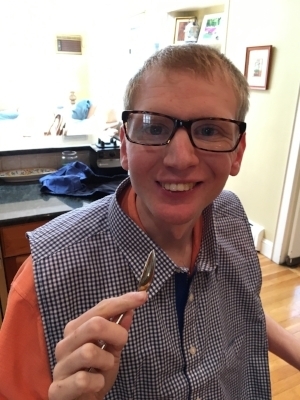 Billy has made the transition to living in a group home and has made it clear that he is happy there. My sister and her husband now deal with the empty nest and enjoy having the group home family for dinners at their house. As a new chapter unfolds, we wish for the best for these special adults. Billy is wearing the men's bonTop, part of the bonTop clothing protector collection.